Kusatsu Kokusai Ski Area is the nearest ski are from Kiyoshigekan. It is located in 10 minutes by car from us. 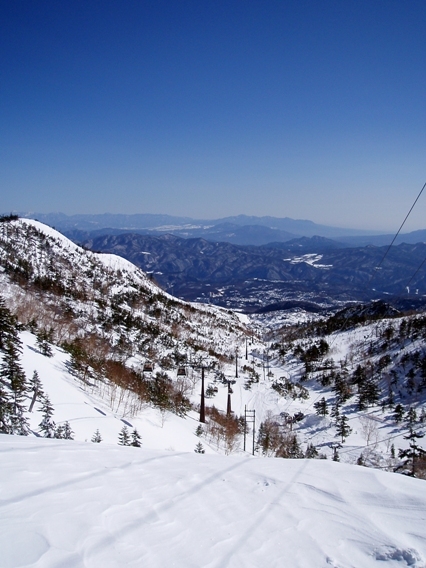 Kusatsu Kokusai Ski Area will be opened from 17 Dec.. there is no snow in Tenguyama area(base of the ski area) yet. Only Moto-Shirane Area is available until Tenguyama Area is opened. To get to Moto-Shirane area, you should take the cable car. And to the cable car station there is a free shuttle bus from Kusatsu Onsen Bus Terminal. Until Tengyama Area is opened, a rental shop of ski gear is in business at the cable car station. The regular operation of the ski area will be finished at 27 Mar. From 28 Mar. the ski area will reduce the operation of the lifts, the free shuttle bus, the restaurants and the shops. The fare of the lift tickets become cheap, but you might feel inconvenience to rent the ski tools and to take the meals etc. On 16 Apr. the ski area will be completely closed. The hot spring in Kusatsu is a strong acid, and very stimulative. It dissolves a big nail in one week. When your skin is delicate, you might feel an itch or a prickling pain after bathing. The symptom often appears in winter. If you feel it, please treat your skin with cream etc. In Japan, it is one of the pleasures in winter to enjoy Onsen after skiing. Kusatsu International Ski Area is the nearest ski area from Kusatsu Onsen. The pride of this ski area is the high quality powder snow at an altitude of over 2,000m and the 8km long trail. The ski area has the gradual slope that the beginner can enjoy skiing. And you can rent the ski gears in the ski area. If you visit to Kusatu Onsen in winter, I want you enjoying ski. The road for Mt. Shirane is closed in every winter. In this next winter, the road will be closed on 11 Nov. After 11 Nov. it is impossible that get to Yugama(the crater lake in Mt. Shirane). And the bus for Mt. Shirane will be closed on 3 Nov. There is a ski area in Kusatsu Onsen. It is “Kusatsu International Ski Area”. It is 15 minutes from us to the ski area by car. If it is possible to management it, we will take you to the ski area by car. This ski area will be opened at 17 Dec.